With more than 36 million members, LinkedIn is the premier business networking site, perfect for keeping in touch with colleagues, networking, finding—or filling—a job, participating in discussions, and much more. Unfortunately, LinkedIn for the iPhone and iPod touch allows easy access to only a subset of the service’s functionality. And glitches with performance and stability will leave most users yearning for an update to the application. The Missing Link: LinkedIn’s iPhone client delivers network status updates directly to your phone, but fails to provide the same level of information delivered on the Web. Much of the value of LinkedIn’s service comes from its ability to navigate the relationships between you, your connections, and other individuals. Need to connect with a company executive to pitch a business proposition? On the LinkedIn Web site, you simply search for individuals—using their name, title, past and present company affiliations, or other attributes. After you’ve identified the person you want to contact, LinkedIn will point out your connections who have a relationship with the individual. You can request your connections to introduce you to the individual through a referral, or you can contact them directly via InMail, a LinkedIn messaging service that protects the recipient’s privacy. On the iPhone, much of this functionality is missing or reduced in scope. Searching, for example, offers fewer options for fine-tuning. And once you find your target connection, there are no options to send an InMail message or request a referral. On the Web, LinkedIn provides an Inbox, containing messages and requests from other individuals. That’s an important capability completely missing from the iPhone application. Similarly, LinkedIn Groups—communities of individuals sharing a common background or interest—are largely missing from the mobile version. While comments or questions from group connections are available in a network updates section, there is no provision to browse, join, or create groups on the phone. LinkedIn’s productivity applications, from partners like Amazon, Google, SlideShare, TripIt, Wordpress, and others—launched in October of 2008, just after the release of the iPhone app—are also missing. LinkedIn for the iPhone has the potential for must-have status among business-oriented iPhone or iPod touch users. But gaps in functionality, combined with sometimes slow and unstable performance, leave that potential unrealized. 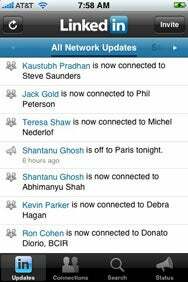 LinkedIn is compatible with any iPhone or iPod touch running the iPhone 2.1 software update.